After a delicious meal, what better way is there to freshen up than with dinner mints? We offer a wide variety of delicious wholesale mints that won’t break the bank. On our easy-to-use website, we feature various hospitality mints, and you are sure to find the specific kind that you prefer. When you buy mints in bulk, you take advantage of the opportunity to get much more for your money than you can expect at most retail stores, and your supply is sure to last a long time. Mints have a counterpart that offers the same delight in gum. Not only do our options taste good, but they can be a perfect way to curb that appetite in between meals. We give you the chance to also buy bulk gum, ensuring that you are never far from a piece when the next craving hits. Nostalgic Clove chewing Gum. Step back in time with this old time gum. 20 packs per box. Dentyne is designed to deliver bold, breath freshening with intense, yet smooth flavors. When you pop a piece of Dentyne, you immediately know that fresh breath matters. The iconic chunk-shaped gum, Americas #1 selling twist-wrap gum is individually wrapped and available in a variety of tasty flavors. The great tastes of your favorite Wrigley's classic gum in a VALUE pack. Choose from Doublemint, Big Red, Juicyfruit, Spearmint or Winterfresh. 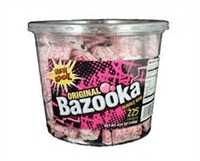 Classic Super Bubble Gum in a 180 count tub. Takes gum to a whole new level by strengthening and rebuilding teeth. Amazing! Available in assorted flavors. 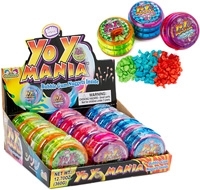 A fun yo-yo with bubble gum nuggets inside! Dreamed up in 1980 by two ball players, Big League Chew has been a favorite of baseball players for over 25 years. Today, Wrigley offers 4 great flavors, all in the classic stay fresh pouch. Bubblicious is the #1 selling bubblegum in the US. For over 30 years, Bubblicious bubblegum has delighted people of all ages with its explosive flavors, taste sensations and the ability to blow the Ultimate Bubble."" 5 is a groundbreaking sugar-free stick gum. The mouth-freshening gum delivers long-lasting flavor and a unique sensory experience with each flavor. The sleek 5 envelope created the next great packaging enhancement for stick gum. Each distinctive envelope has an eye-catching design and holds 15 sticks. There's nothing better than bubble gum, except when the bubble gum is taller than you! With Bubble Tape, you can rip off a little bit or a whole bunch, its your choice!! The gum that will bring tears to your eyes. Individually wrapped sour gum balls with a major kick! Orbit has received the American Dental Association's Seal of Acceptance." A fun novelty gum, kids love them! Throw a splash of color on your tongue with vibrant red, orange, blue, green and purple gum balls. Just dont eat any before that important meeting, because the color tends to stick around. Individually Wrapped White Home Run Bubble Gum Balls that look like baseballs. Great for concession stands! The great tastes of your favorite Wrigley's classic gum in a new slim pack. Choose from Doublemint, Big Red, Juicyfruit, Spearmint or Winterfresh.